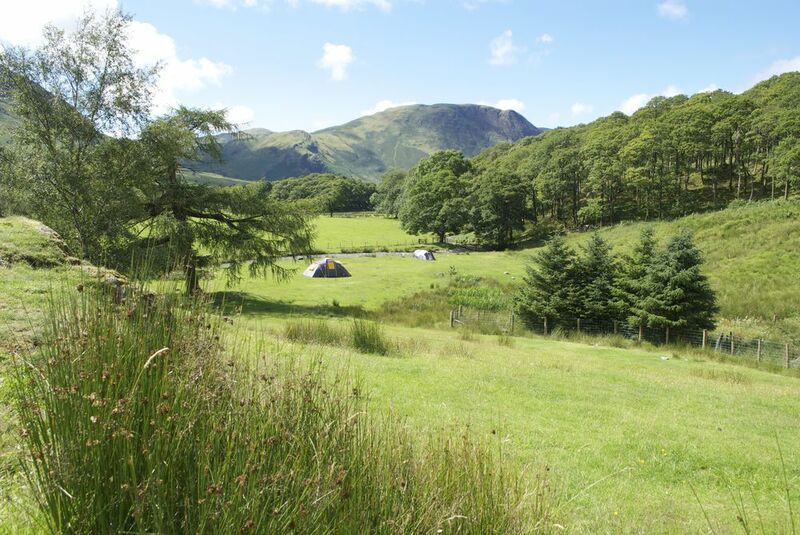 Located in the north-western segment of the Lake District National Park, and resting on the banks of Crummock Water surrounded by stunning mountains, lies a picturesque campsite that provides an ideal base for adventure. Here lies Syke Farm campsite. Syke Farm campsite can accommodate up to 40 tents, and the topography and rocky outcrops make each pitch feel like the only one on site. The nearby Crummock Water offers one of the most stunning lake-side views in the Park, and Buttermere Lake close by is arguably one of the most stunning and enjoyable low-level walks in the Lakes. Syke Farm campsite nestled amongst the mountains. Staying on the campsite is close to being a wild camping experience, but enough facilities, with two showers, to make you comfortable enough after a long day out on the fells. You will struggle to get mobile signal, which is always positive to experience in such a stunning location, and food and drinks are limited to being purchased from the two local pubs, two tea rooms, a Youth Hostel nearby, and the farmhouse offering eggs and milk. One of the tea rooms can be found at Syke Farm itself, just at the top of the village by the church. Home-made cakes, pastry’s and lunches, as well as a ‘Campers Full English Breakfast’, are available. But do find out opening times, particularly if you are camping outside the busy summer season. The bridge access to Syke Farm campsite. You can relax in the campsite and plan your adventures in the surrounding area, or simply sit back and spend time taking in the splendour of the views the mountains and lakes offer, encompassing your camping experience on site. The local adventures on offer are plentiful, which makes Syke Farm campsite a great base for a multi-day stay. There are lots of low-level walks, fishing and non-motorised boating on the lakes, and higher peaks including Fleetwith Pike, Haystacks (Wainwright’s favourite mountain) and Rannerdale Knotts to explore. 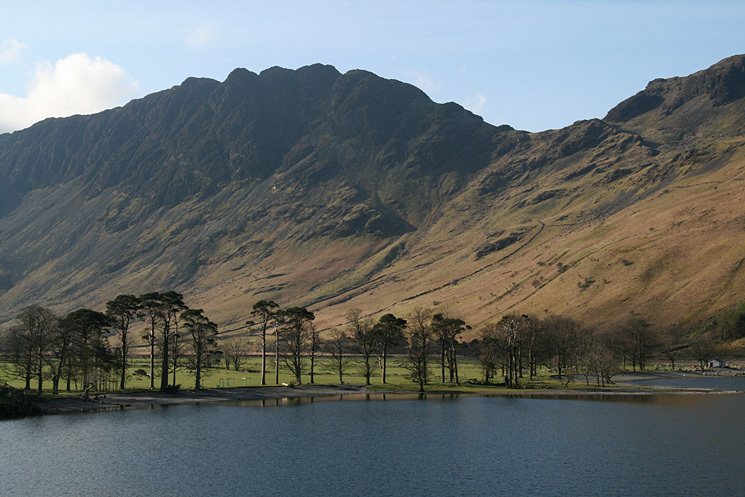 For the more adventurous, head out and enjoy the ‘Buttermere Round’, one of the best ridge walks in the Lakes. Walk out of the campsite and up passed the hidden Scale Force, the highest waterfall in the Lake District with a single drop of 170ft, before climbing up to Red Pike and across to High Stile and Haystacks. Loop back to Gatesgarth and returning into Buttermere for a hearty meal and a look at your photos from the day. If Buttermere becomes too crowded with visitors in the height of the summer, then head out of the campsite one early evening and up to Bleaberry Tarn. A steep ascent but the vista is well worth the effort as the location is known to be a great wild camping spot; an incredible experience on a clear night with Chapel Crags looking down upon you. Heading out at dawn to climb Red Pike and High Stile and beyond on a linear or circle trek of your choice. The routes can be varied and all incredibly rewarding. Ensure you have the right equipment, knowledge and weather forecast to hand before you set out on your exploration. View from Buttermere to Haystacks. If you want to venture out of the area for some adventure, then the Via Ferrata and mine tours at Honister slate mine might whet your appetite. Many activity centres in the area also provide exhilarating days out for groups, families and individuals. Rock climbing, canoeing, caving, kayaking, mountain biking, gorge scrambling, high ropes, walking and trekking, archery and abseiling can all be part of your adventure experience in the Lakes. 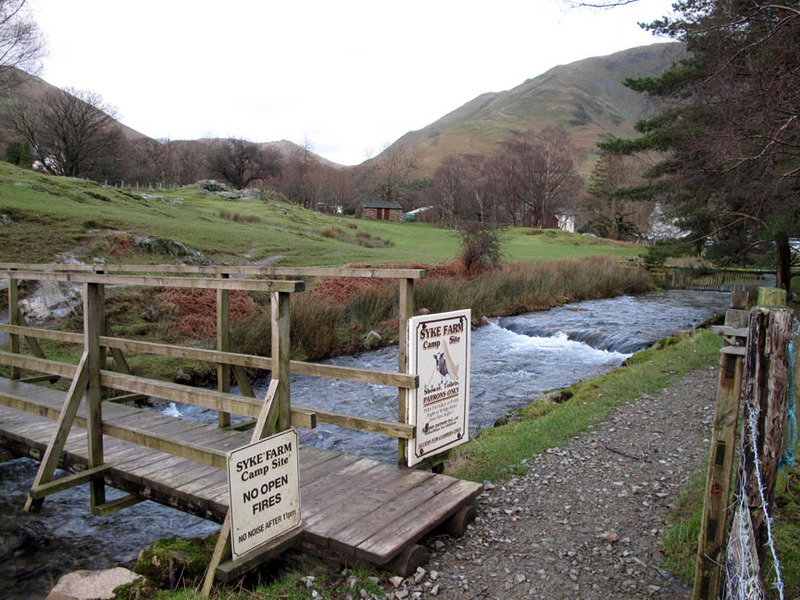 Adventure providers close to Buttermere include Glaramara and Newlands Adventure Centre. You can also view the adventures offered by Keswick Adventure Centre or enjoy a Go Ape high ropes experience at the nearby Whinlatter Forest Park course. There is something for everyone in the Lake District National Park, and Buttermere provides a tranquil retreat to explore a beautiful part of the world. Syke Farm campsite is unique with the panoramic views simply breathtaking; and like a naughty ginger biscuit, once tasted you’ll be impatiently wanting to experience the sensation again.